This is a guest post from Ariel. I’m a 3rd year law student at the University of Southern California Gould School of Law, and I’m a healthy lifestyle entrepreneur. When I was seventeen, after playing competitive basketball all my life, I was told that I had a leak in one of the valves connected to my heart and that I had to give it up. After my life took a pretty sharp downhill turn, I stumbled upon the book “How To Win Friends and Influence People” by Dale Carnegie. I quickly became obsessed with the study of successful people and what in fact makes a person successful. 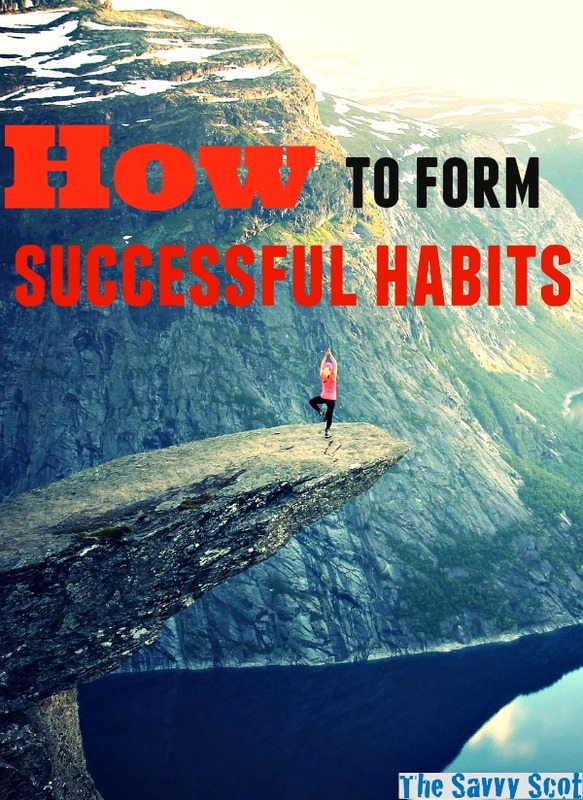 I kept seeing the same habits come up over and over, and I began to implement the habits that I saw most successful people incorporated into their lives. I started waking up at 6 a.m., exercising every day, reading, and meditating. I owe every accomplishment in my life – to my habits and one of my life goals is to spread the understanding I’ve gained through my experience. Let me know if you want to guest post on Savvy Scot. There’s one real truth that we all have to accept in order to place ourselves on the right path to success. We ARE our habits. Our lives are comprised of the sum total of the things we do on a daily basis, not the things we do sometimes. Once we’ve accepted the fact that our lives are comprised of the daily actions we take, the next step you have to take in order to move from where you are right now to where you want to be, is to determine the daily actions that will take you from here to there and find ways to actually implement these daily actions into your life. That being said, there are certain habits, what I like to call ‘success habits,’ that almost all successful people seem to incorporate into their lives in some way or another. The habits themselves are precisely related to your welfare; your physical, mental and emotional well-being. If you’re feeling great physically, are able to withstand and deal with problems that might invoke difficult emotions in you, and mentally you aren’t bogged down by identifying with every passing thought, you are essentially giving yourself the energy and space that you need to be an energetic, creative, problem-solving individual on a pathway to success. The only question left is, what are these habits & how do I implement them into my life? The reason waking up early is correlated so highly with success is that the world is truly quiet in the morning hours and distractions are at a minimum compared to the rest of the day. You can use the morning hours to either get a necessary task done before the day even really starts or you can partake in another activity that will help ensure your mental, physical or emotional welfare for the coming day by eating a good breakfast, meditating, reading, writing, etc. Sleep early and stay consistent about sleeping at a reasonable hour. All your bags packed and ready to go for the next day so you don’t have to do anything besides pick it/them up on the way out of the house. The clothes you want to wear the next day should be decided and laid out so you can just put them on after you brush your teeth or shower. What you want to eat for breakfast (I recommend eating breakfast to help create lasting energy for the day). A thought out plan for what your morning will consist of. As soon as you open your eyes, JUMP out of bed and do something active like 5 pushups or 10 jumping jacks. What this does is it gets your energy flowing and literally forces your body to wake up without giving your mind a chance to come in and convince you to sleep for those five extra minutes. Don’t waste any time before you get your day started. Looking good and feeling more confident about your physical attraction are just a few of the incidental benefits of exercising. When you give your body the physical stimulation that it craves, your body literally rewards you with happiness in the form of endorphins. Creating this beautiful reciprocal relationship with your body is one of the keys to success. Think deeply about the type of body you want. Do you just want to lose weight? Are you trying to put on muscle? Do you want to tone up? Do some research about different activities that will get you the results you crave. Determine which of the activities that will help push you towards your goal body seem the most fun to you. Which of these activities do you genuinely think you will enjoy? Set aside a specific time in your schedule to engage in the physical activities you choose and try to the greatest extent possible to remain consistent about the times you dedicate towards your physical well being. After a few weeks, your body will be ready for physical activity at the time you ordinarily exercise. If you see that your physical activity is starting to feel more like a burden than an enjoyable time of the day, switch it up! Go back to the drawing board and think about different ways to exercise that sound fun and appealing to try. To operate at maximum productive capacity, you need to have maximum energy levels. Begin paying attention to how your body responds to the different foods you eat and you’ll quickly understand the importance of not over-eating and eating nutritious foods that fuel your body with clean energy. You’re not dieting, you’re just cleaning up your diet. Our junk food intake has to be at a minimum and the easiest way to ensure that happens is by simply not buying soda, chips, chocolate, candy, etc. for your home. Keeping your home clean of junk will help keep your diet clean. Try to eat bread and other carbohydrates earlier in the day rather than during dinner and as part of late night snacks. Water, water and more water. Water helps keeps you full and fresh. Dehydration manifests in pretty subtle yet aggravating symptoms. No matter what the rest of your diet looks like, make sure to eat vegetables and fruits. For your body to operate at its maximum possible potential it needs a strong immune system along with nutrients required to ensure its health and energy. All day long our minds are racing at 100 mph and most of the time we’re not even aware of it. We don’t ordinarily think about our thoughts as events that require energy, but every thought that we have requires a certain amount of energy. The thoughts that we really identify with strongly and force us into imagination drain us. Meditation helps patch up the leaking of energy caused by the neuroticism of our minds. Full body stretch for 2-3 minutes. Sit comfortably in a chair or cross-legged on a pillow on the floor. If you’re on the floor, try to sit on the edge of the pillow so you’re leaning forward towards your knees as opposed to your back to ensure no pressure on your spine. Close your eyes and try to follow your breath. Become aware of the fact that it is taking lace. Your mind will begin talking immediately and all you have to do is see it. It’s not about controlling what the mind is saying, you’ll quickly realize you can’t do that. The point is to simply be aware of what is taking place and come back to your breath when you are taken by the flow of thoughts. The habits discussed are meant to prepare your body, mind and heart for whatever they’ll each be faced with throughout the day. Remember, you are your habits. If on a daily basis you eat a bunch of junk, disrespect your body by failing to providing it with the physical stimulation it needs, and allow your thoughts to run your day, you cannot possibly operate at your maximum potential. Just like you need to take care of your car with oil, gas, water, and good breaks to run perfectly, your body, mind and heart need you to take care of them. Why is it so much easier to go to the gym when you have a trainer? Why does it motivate you to work hard when the people around you work harder than you? Having someone to help make sure you stick to your goals is one of the keys to changing your habits. When you and another individual make a commitment to keep each other in check, you not only have someone that is counting on you to help them progress, but they’re there for you every step of the way helping you through the struggle. Partners In Grind is a free tool that pairs two individuals up who would like to implement the same habit into their lives. As soon as partners are matched, they become each other’s personal coaches and create momentum for positive change for each other’s lives through setting individual goals and helping guide each other through difficult points with constant positive reinforcement and encouragement.